I have news for you! The lovely Jess Haines finally got news regarding her next release and she would like to share it with you all along with a terrific giveaway! 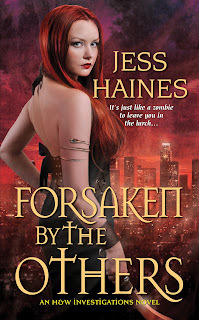 Forsaken by the Others is the 5th book in Jess Haines' H&W Investigations urban fantasy series and will be released on 2 July 2013. To celebrate the cover reveal of Forsaken by the Others Jess is hosting a giveaway! You could win your signed book of choice of any of the H&W Investigations novels, a signed Forsaken by the Others cover flat or ebook of Silent Cravings! For more chances to win visit Jess Haines' website. Get up to date on the H&W Investigations series: Amazon has a fantastic deal: buy the first 4 novels for only $ 9.99! !